I met Kandy and Selma in the university in Windhoek. When I sensed that they had grown up in exile, they told me that they had spent their entire childhood fleeing South African elite troops since both their parents were anti-apartheid freedom fighters in SWAPO. Both their parents were killed in the struggle and for years they had been starving in the bush. But one event had saved their lives. Namely when they found safety in the Kwanzu Zul guerrilla camp in Angola. One of my Danish friends in Windhoek then replied to them: "Are you aware that Jacob financed that camp?" Then our friendship was instantly made. One of the last things American Pictures helped finance in Africa in cooperation with IBIS was this camp and it was therefore one of the happiest moments in my life now to meet people who claimed that they wouldn't have been alive if it had not been for our efforts. See below how their family responded when finding this page on the Internet. I was very moved by looking at your slides about Namibia. Thank you very much for such powerful images that need to be seen by the rest of the world. I am originally from Namibia, and currently in the USA working on my doctoral degree in education. 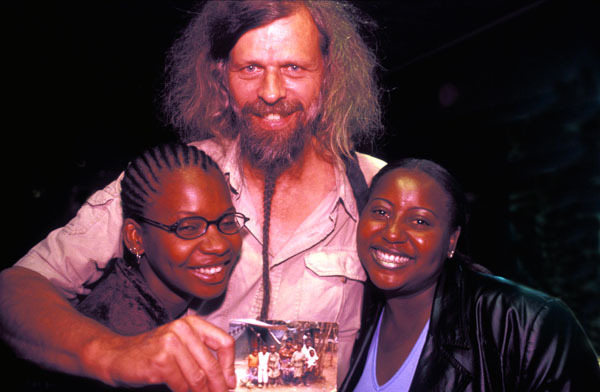 Of interest while going through your Namibian slides, is a picture of you with my cousins, twin Kandy and Selma Neumbo. Talk about small world! It is true that they are product of the guerrilla war-fare. Most of my family members were in exile, but my mother didn't go outside the country. I was brought up in Namibia, but many of my family members, such as Kandy and Selma's father died while in exile. Most of my family members were killed in Kassinga massacre in Angola. You definitely have helped many of my family members or children of people I know or know my larger family. Thank you, Jacob for the sacrifices you have made in life to help others.